This is PLC Program to implement analog scaling in S7-300 PLC. 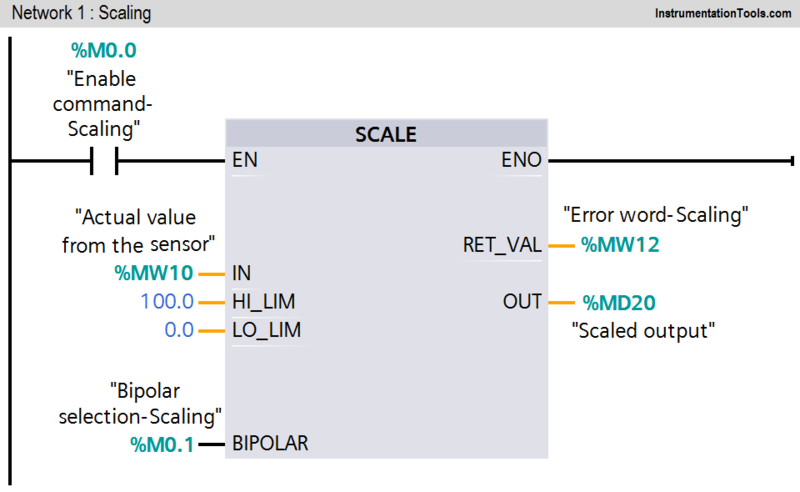 Implement PLC program in S7-300 for analog scaling. Analog inputs come from different sensors or transmitters. Transmitters convert physical quantity into electrical signal. We can measure many physical quantity by using analog sensors such as temperature, pressure, level, distance, flow etc. Of course we can measure all physical quantity by using analog sensors, but for example and explanation purpose here we take one example of control valve. As shown in figure, here we consider one control valve and it has 4-20mA output (valve feedback) and 4-20mA input (valve command) for operation. Hence, when PLC will give 20mA to flow control valve, valve will be open 100% and for 4mA it will be 0% (close). In other way flow control valve is also providing output signal that can be used for close loop system/for valve percentage indication. If valve is 100% open, PLC will get 20mA signal and for 0% it will get 4mA. Note:- We consider here close loop system for simple explanation, so operator will set control valve open command parameter in range between 0% to 100% . 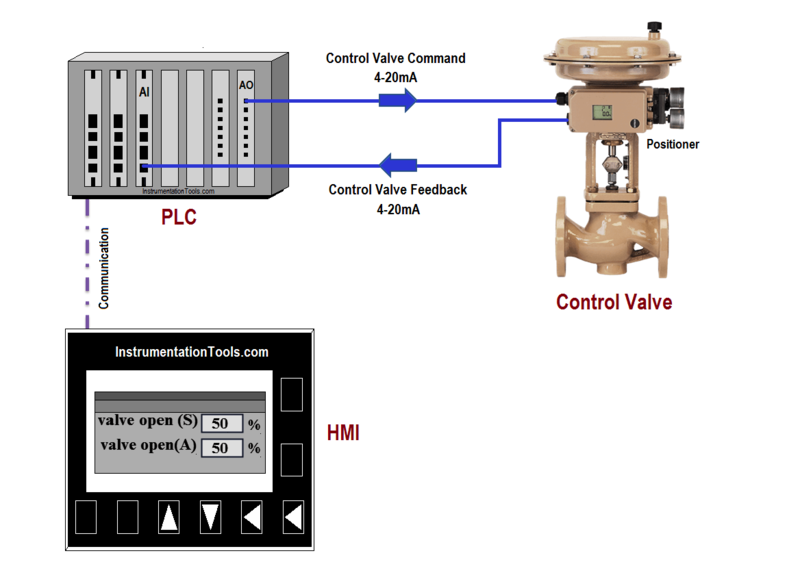 Now as per close loop system, control valve will provide output signal (valve feedback) and by using SCALE instruction, operator can see actual valve open parameter on graphics. In this network, scaling logic is executed when Enable command (M0.0) is ON. The “Scale” instruction is to convert the integer (here 4-20mA signal from the control valve or MW10) at the IN parameter which can be scaled in physical units between a low limit (0% output) and a high limit (100% output). The result or scaled output (MD20) of the instruction is output at the OUT parameter. If bipolar selection (M0.1) is ON, it is assumed that the value at the IN parameter is bipolar (range between -27648 to +27648). If bipolar selection (M0.1) is OFF, it is assumed that the value at the IN parameter is unipolar (range between 0 to 27648). 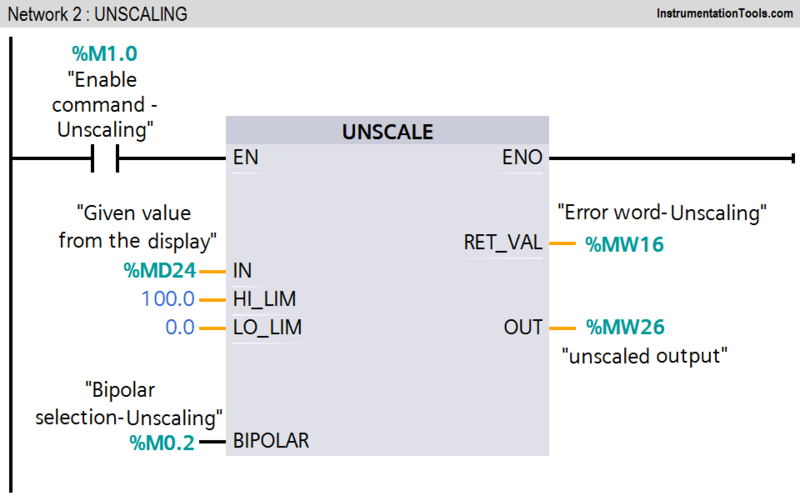 The “Unscale” instruction is used to unscaled the floating-point number (given value from the display or MD24) on the IN parameter into physical units between a low limit and and a high limit. The result of the instruction is output (unscaled output MW26) at the OUT parameter. If bipolar selection (M0.2) is ON, it is assumed that the value at the IN parameter is bipolar (range between -27648 to +27648). If bipolar selection (M0.2) is OFF, it is assumed that the value at the IN parameter is unipolar (range between 0 to 27648). Note:- Above application may be different from actual application. This example is only for explanation purpose only. We can implement this logic in other PLC also. This is the simple concept of SCALE and UNSCALE instructions, we can use this concept in other examples also. What is Split Range Control Loop ?